The #FC Youth Voice team are recruiting! #FreshCreations is a Youth Arts Hub funded by Time to Shine, Creative Scotland. We are located in Clydebank, and provide youth arts activities for young people all over West Dunbartonshire. Every fortnight our Youth Voice team meet and come up with ideas for future projects with #FreshCreations. We provide free dinner at each of our meetings and occasionally go on trips! This is a great opportunity for any young person 10-25 years old who wants more responsibility and a chance to bring creative ideas to life! 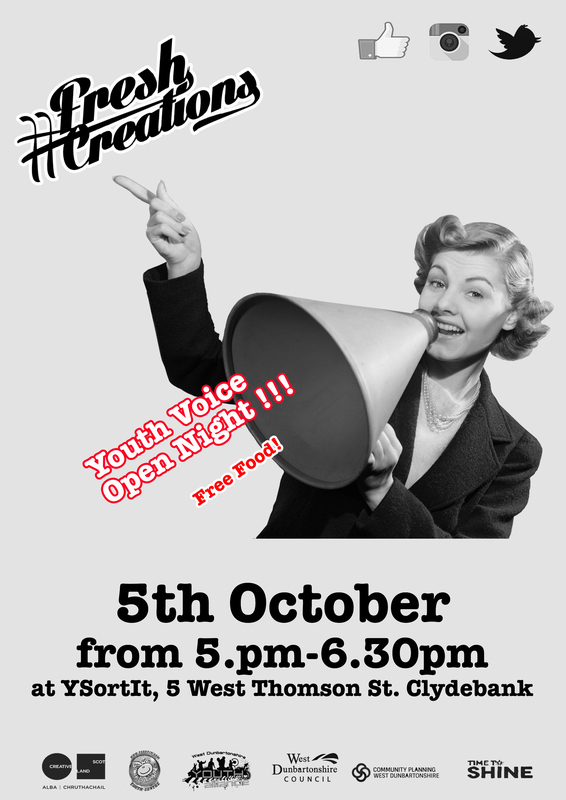 Join us for our Youth Voice Open Night where we will be recruiting new members.